As a regular reader of this blog may remember, I used to do a lot of screenprinting back in grad school. It's certainly possible to recreate the kind of setup I had at back at school here at home, but it takes a few resources that I don't readily have access to, namely space and a hacker's mentality. So when the YuDu screenprinting machine came out last year I was immediately jonesing to get my hands on one, despite mixed reviews. And let me tell you, the mixed reviews are pretty justified. But after several weeks and more money than I made on the order that prompted me to finally unbox the YuDu I received for my birthday last October, I feel a bit like I just broke the spirit of a wild stallion. After skimming most of the Amazon reviews, I knew the included instructions and DVD were mostly useless. I didn't even look at the DVD but I will say the one-page pamphlet (only in pamphlet form because it's replicated in about half-a-dozen languages) seems useful as a visual reminder of the steps necessary to prep and print your design. I did, however, look at about a gazillion different blog posts and video tutorials online from folks like me working their way through the YuDu's steep learning curve. A couple of my favorites include Erin Bassett's blog and video tutorials, found here and here, and Journal Girl. I looked at so many tutorial videos and blog posts that I honestly can't recall every little tip I picked up but it does help to do some anecdotal research online before you begin. Let the YuDu trailblazers shorten the learning curve a bit! So with the disclaimer that the YuDu is not exactly as easy as they'd like you to believe, here's what I found to work for me. As just about every blogger and reviewer has complained the hardest part about YuDu is applying the emulsion sheets just right. 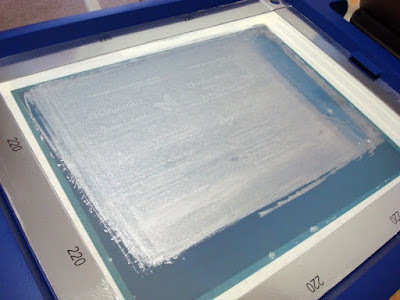 If you don't know much about screenprinting, let me break it down for you this way. Basically, YuDu wants you to bend the laws of physics and will lead you to believe that this is a laughably easy thing to do. It's not. They've created the emulsion sheets so that you don't have to deal with the mess of liquid emulsion, from adding the sensitizer to applying a thin layer of the stuff to your screen using a scoop-coater. We had a whole room for this part of the process back in grad school. So that's cool. But now you're trying to do something in solid form that's ideally applied as a liquid. The way you do this is with the magic of water, but just how much water is on your screen is the difference between you turning into a frustrated sobbing mess (okay, if you're not a sleep-deprived parent of a young toddler, maybe it won't be that bad) and happily printing your t-shirts and what-have-you. The official instructions are to wet your screen so that it's damp but not dripping. 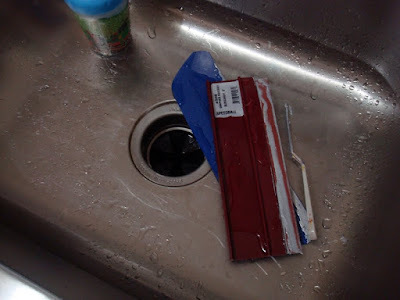 What I found to work, after removing emulsion from one of the first three failed attempts, was to sort of pat my recently rinsed screen with a paper towel. Any drippy bits will make your emulsion run and where it runs it won't "burn" the image properly, but if it's too dry the more or less solid emulsion goo won't work its way into the itty-bitty holes of your screen's mesh. So once your screen is damp but not drippy I found that it helped to run a wet (again, not super duper drippy wet but wet enough to get water in each and every hole) sponge over both sides of the screen. Right after you do this, pull a sheet of emulsion out and lay it, tacky side down, shiny side up, on the side of the screen where the mesh is flush with the metal frame. I started at the top and let the emulsion kind of work its way down. Use the "squeegee" (I put this in quotes because I have to be a snob on this point...I'll talk more about this later but do yourself a favor and get a real squeegee at your local art store or online) to sort of smooth/flatten the sheet of emulsion. You can take a look at the other side of your screen to check for any webbing or areas where the emulsion is not attached properly. If you need to do some spot treatment, I found that using a fine-mist spray bottle sparingly over the problem area helped (spray on the underside, followed by another smoothing over with the squeegee on the top, where your emulsion is protected with a sheet of acetate). But again, use caution because if you're too generous with the spray bottle, as I was during one of my first failed attempts, the emulsion will run and your image won't burn properly. One of the best tips I got from Journal Girl, above, is to put the screen in the drying rack shiny side down. And let it dry for at least three cycles. Some folks recommend speeding up this process with a hair dryer but I found this to be unsuccessful because the air moved around the drops on my too-wet screen and caused the emulsion to, you guessed it, run. During one of my first three attempts at mastering the art of emulsion application I got enough of my design to burn to do a test print, which led me to the realization (something I should have already known from three years of grad school) that the 110 mesh screen that comes with the YuDu machine wasn't going to be fine enough to print text (turns out legibility is kind of an essential quality in a wedding invitation). So I took about a week off from YuDu learning curve anxiety while I waited for a 220 mesh screen to arrive. If you're doing anything with fine detail, do yourself a favor and get a 220 mesh screen. Don't even bother with the 110; reserve that for larger, bolder graphics as I plan to do with the two screens I have. Another thing that I remembered from grad school while waiting for the 220 mesh screen was that we'd always "de-grease" a new screen before applying emulsion for the first time. So I gave this a whirl, applying a tiny drop of dishsoap (I think we used laundry detergent in grad school but I'm not sure it matters) to my new screen and rinsing that out thoroughly since I wanted it to be wet anyway. And who knows if it was coincidence (third time's a charm?) but this go-round I applied the sheet of emulsion to my screen no problem, other than a couple of small glitches around the edges. I left it in the drawer for three dry cycles before I even took a look and sure enough, the acetate came off without any problems (if you start to peel the acetate away and it sticks at all, stop what you're doing and put your screen back in the dryer for another cycle, otherwise you could tear your emulsion). While my screen was drying, of course, I had plenty of time to get the transparency I'd had printed for awhile (first at Kinko's since my old printer wouldn't print transparencies then a revised version on my new inkjet printer, tweaking the font a bit to optimize printing results) on the light table. Burning the screen was pretty straight-forward: once emulsion is dry remove acetate, place screen on posts emulsion-side down, place t-shirt platen on platen posts felt side down, add about 5 pounds (I added a two-pound weight to my box of YuDu supplies and ink and that seemed to do the trick) to the top of the t-shirt platen and hit the expose button. I let it go the entire 8 minutes although I have read that you may want to dial down the exposure a bit to pick up finer detail. I may try this with any future text-based projects. When the 8 minutes is up, remove your screen from the YuDu machine and immediately rinse it with cool water. The emulsion blocked from the light by the design on your transparency should rinse away; I found it was necessary to gently rub the screen to get the emulsion goo to really budge and wash through. You want all the emulsion out, of course, so your ink can pass through. Having mastered the art of emulsion application, you'd think my journey to success was through. But wait, there's more. After rinsing and yet again waiting a bit for my screen to dry, I taped off the areas between the emulsion and the frame and eagerly set out to pull a solid print. Unfortunately, I found YuDu inks straight out of the bottle to be too thick to pass through the finer holes of the 220 mesh, prompting a trip to the art store to purchase a different brand of screenprinting ink, some extender, and a proper squeegee. Here's my squeegee post printing. You can see that I used a plastic palette knife (you can find these in the painting section) to mix my ink and reclaim it during and after printing (the ink builds up on the squeegee so it's helpful to scrape it off every couple of prints and apply it right back on your screen). Using my new squeegee and Versatex ink yielded pretty good results, not exactly what I was looking for but way better than anything I'd printed on the YuDu thus far. 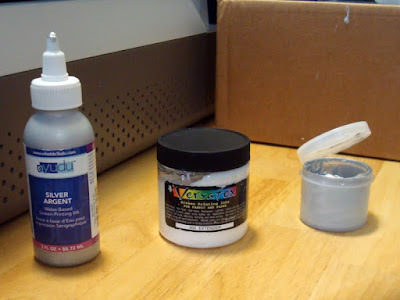 Unfortunately, the silver I was able to find on short notice wasn't quite the silver I'd promised my client so I tried again adding a bit of extender (probably about 3 parts YuDu ink to 1 part extender, roughly - I basically just aimed to copy the viscosity of the Versatex ink). You can find these little plastic containers in just about any art or craft supply store so that you can mix and save enough ink for an entire print run. YuDu ink + extender + new squeegee = success! I don't recommend using a fruit bowl or kitchen counter as a drying rack, but sometimes your options are limited. Limited drying space aside, I also noticed the screen was getting a bit over-flooded with ink after about a dozen prints. Fortunately, this was a small order so I was able to print about double what I actually needed before I had to call it quits and rinse my screen out, but I would imagine, especially considering how long it seems to take the screen to dry each time, that this will get annoying on future orders. It happens with any style of screenprinting but I definitely got more than a dozen prints from the screens and setup I had in grad school. I figure if I can print wedding invitations with this thing (not exactly what it was designed to do), I can print just about anything....Right?? You win! Woman over machine. The wedding announcements are beautiful. WOW - I am so impressed! I know how small your space is and to make the screenprinting process work - remarkable! You are the woman. 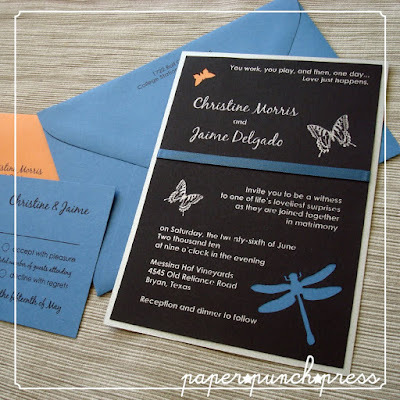 The invitations are beautiful. You are amazing! Thanks for the nice comments, you guys! Hopefully I have continued success with future projects (and some time to do some of my own work would be nice, too :))! Wow Becky. Sometimes when I am so frustrated with dealing with people I fantasize about being talented at something and being able to just quietly create things and that would be less stressful. BUT after reading this I realize that I would NEVER have the patience for all this! I seriously still don't understand how screenprinting works, but my god you went through one hell of a learning curve! The end result looks great though, so congratulations! Can't wait to see what else you do! I don't know, Mer - I can't imagine the kind of stress you must have to deal with. This is so different. Frustrating but not stressful (mainly because the client was super laidback and we had plenty of time to get these done!). 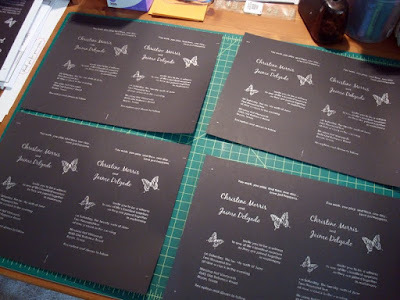 Up next (hopefully, although I may be counting my chickens before they've hatched here) is an order with a custom screenprinted paper wrap around a tea-length invite...something the YuDu and screenprinting in general is much better suited for. this is just awesome!! 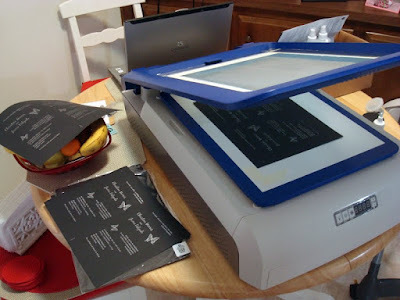 I am getting ready to tempt my fate at this process....I need to buy the finer screen still, but found that your input is helpful and hope to put it to use. 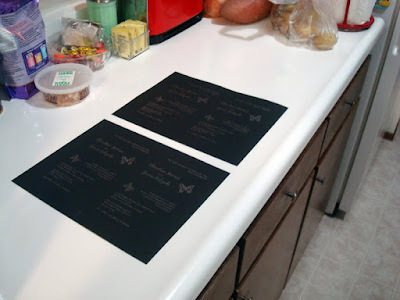 I am going to see if embossing after a print works...I imagine the ink would be wet enough to grab that powder and that it would add a nice touch. Do you mind me asking what font size you used? I've heard embossing does work! The ink stays wet for a bit but I'd recommend having a printing partner to share the printing & embossing duties (if you print your entire run before embossing the ink may be too dry, but if you take a break after each print to emboss, the ink may dry in your screen and you'll end up spending a ton of time cleaning it out!). But I've heard it looks a lot like thermography which is pretty cool! As for font size I used 28 for the script and just 12 point for the basic font, which is Century Gothic (didn't want a lot of serifs and details that were sure to print poorly! ), but bold, which seemed to be key (i.e. thickness over overall size). Good luck! Thanks for the advice on the font size and I def plan to use a partner (thank you fiance!) I figure he can handle the powder part just fine...I got my screen the other day and am hoping to try my hand this weekend..here's to taking that good luck!